Katie Pritchard scored 4 goals this evening, reaching a regional milestone. She now has 167 goals for her career, tying her with Anne Felts of the Rolla Bulldogs as the most prolific scorer in Southwest Missouri. Michaele Fulmer of KC O’Hara owns the state record with 204 but Katie’s next goal will place her second in the state record books. She’s pictured from the game against Glendale earlier this season when she scored a hat trick, including the game winner in OT. In addition, the Tigers completed a 9-0 run through the Ozark Conference this evening with their win over the Vikings. Glendale is their closest competitor, and shared the crown with them last year, but it is the Tigers alone at the top this season. Congratulations to Coach Josh Scott and his squad! The Liberators visited this evening and fought hard (that’s senior Lindsy Archer pictured) but were unable to break through the Irish defense. Tara Bailes, playing her first full match without her knee brace, led Catholic with three goals and an assist. Anna DeLong scored twice and Shelby Hatz once, while Natalie Smid had two assists and Emily Kessler had one. The Liberators had a few good opportunities in the first half (while I was there), the best when freshman midfielder Izzy Mersch sent Archer into the box with a nice diagonal ball. Archer was able to find space in the box and get her shot off but freshman Rachel Scott reacted well to the ball and pulled it in. The rematch will likely be Wednesday May 14th in the District Final. Photo slideshow from the 1st Half. The wind was blowing hard tonight but the Falcon’s didn’t let it disturb them as they rebounded from an early goal by the Yellowjackets, scoring two against the wind in the first half to eke out the victory over last years vanquishers. Lebanon got on the scoreboard in the 3rd minute when Hanna Winkel won a 50/50 ball in the offensive end and broke past the defense. She shot quickly and caught the keeper off the line and the ball just went in under the crossbar. The Falcon’s evened it in the 14th minute when the defense was caught napping on a corner kick by Jamie Bond. 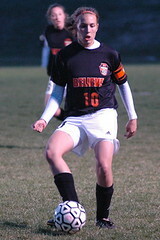 Lindsay Sprouse was unmarked in the box and one-timed her shot into the left side of the net. In the 23rd minute, it was Karis Hefton who got the game-winner (pictured). She was sent into the box on a fine through ball by senior Megan Garrad, and despited being challenged as she entered the box, Hefton hammered a shot from the penalty spot that blew by the keeper into the roof of the net. The second half was scoreless, as both goal keepers stepped up tonight. Abbey Roam for the Yellowjackets had to face a half dozen corners kicks as the Falcons used the wind and their speed to get into the corners but she didn’t back down, including one remarkable sequence that finished with her diving at Lou Opfer’s feet to finish it. Rachel Duckworth, for the Falcons, continues her on-the-job training with a flourish. In the 65th, Lebanon counter-attacked from a Glendale corner kick and sent Chelsey LeFors in on goal. Duckworth’s instincts were excellent, coming out quickly and diving for the ball. The rebound was sent back in quickly but somehow Rachel was able to get back up and make the final save, diving once again as the attacker tumbled over her in the box. Both teams went about their jobs in workmanlike fashion tonight, saving the real intensity for the District playoffs I have to assume. Lebanon needs to show patience in the offensive end while trying to avoid giving up the corner kicks and fouls outside the box. The Falcons are going to have to improve their efficiency on set pieces if they want to avoid these close games. All of it bodes well for the spectators as the District 11 playoffs offer some excellent soccer. 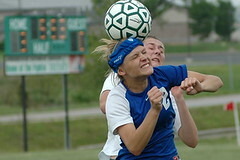 I’d also be remiss if I didn’t send a shout out to Lebanon’s Emily Boyer, their sophomore midfielder is out with mono. I missed her energy. 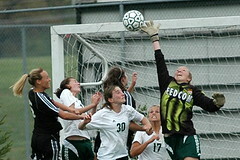 Janell Glidden was a talented, physical presence in the middle and up top for the Yellowjackets and a new face for me. Welcome back to the game! Photo slideshow from the game. 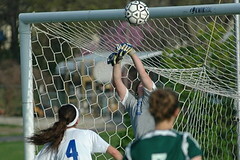 The Lady Lakers defeated Joplin in a penalty kick shootout. Camdenton led 1-0 early in the match when sophomore midfielder Jessica Smith received a pass across the mouth of the goal from senior Meg Manzer. The score stayed 1-0 until the second minute of the second half when Joplin scored on a free kick that got past senior goalie Krista Murphy. The 1-1 score held until 10 minutes left in the match when Manzer was fouled inside the penalty area and senior midfielder Blaire Baker scored on a penalty kick. With less than two minutes left in the match, a Camdenton foul inside the penalty area resulted in Joplin tying the match up 2-2, again via the penalty spot. After two ten-minute over time periods, the match went to a pk shootout. It was Camdenton’s third of the season and Joplin’s first. 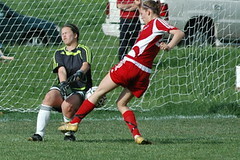 The Lady Lakers won the shootout as all five of Camdenton’s shooters made their penalty kick. Camdenton’s Krista Murphy was able to stop Joplin’s third shooter on a diving save that was pushed off the right post and rolled back towards the shooter. Joplin’s fourth shooter scored on a penalty kick which left it up to Camdenton freshman Ashley Paschel to calmly step up and hit her first ever high school penalty kick which ensured a Camdenton victory 5-3. Three seniors scored goals for the Lady Tigers on Senior Night en route to the shutout over district opponent Neosho. Kristen Glaubitz got two, Erica Hogan got one as did Jessica Bush. Sophomore Megan Gunnels and sophomore Alicia Collard rounded out the scoring for Ozark. In the first ten minutes of the game, the Lady Eagles had scored two goals; one by senior forward Stephanie Allen and one by freshman out-side midfielder Kelsey Bartell. Both goals exemplified Nixa’s renewed confidence and hunger for goals. The Lady Jays’ Ashley Honeycutt slipped behind the Nixa defense and slotted the ball into the net soon after. Allen got two more in the second half for her hat trick.
. She would be called on again to backstop her teammates as Delong broke in alone. Catholic had a series of set pieces and corner kicks late in the half but were unable to score. The Falcon’s finally broke the deadlock in the 58th minute, scoring on a header by Lorin Opfer from a corner kick by Emilee Williams. It was classic Opfer, as she went up in the middle of a crowd to find the ball. It came after a period of sustained pressure at the start of the second half, including Emily Cline’s breakaway in the 4th minute of the half, broken up by freshman Rachel Scott (pictured above) and cleared from behind her by defender Rachel Herron. It was beginning to appear that the wind and the pace would conspire to tire out the Irish. It’s a regular model for the Falcon’s as their 15 player rotation offers depth and speed that is not matched by many teams in the region. There is no quit in the Irish however, and it was the fourth breakaway of the game when they finally broke through, as Shelby Hatz unleashed her shot from 12 yards out and to the far post on her third opportunity of the day, and out of Duckworth’s range this time. That is the real story line of this game – senior Rachel Duckworth of the Glendale Falcon’s can no longer be considered a rookie goaltender after the display she put on this evening, including two late saves requiring her to go horizontal to push shots wide. For the Irish, freshman Rachel Scott matched the result with her saves on shots inside the box in the final OT period in addition to her earlier work. The resulting tie led to PK’s. Catholic shooters Anne Prenger, Ronnie Renner and Tara Bailes scored while the Falcons Cline, Opfer and Katie Brewer matched them in the initial round of five. In sudden death, GK Rachel Scott scored as did junior Maddy Renner while Maggie Schrier for the Falcons also scored. Advantage Irish 5-4 after seven rounds. Now is as good a time as any to introduce you to my new photo website as well. In an effort to cover expenses (time, gas, my supplies) I’ve set up a site that offers printing services. Click on the Slide Show link and you’ll be taken to the site. You can see full resolution photos and order a wide variety of photo products featuring your favorite players by your favorite soccer journalist. Your support, via purchase of photos, will be greatly appreciated. My earlier 3-0 report was the score that KOLR10 reported on their news broadcast last night. It was good to see them covering soccer. I’ll get more details on the game soon. 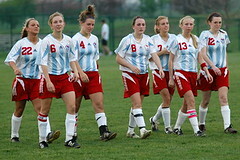 Hillcrest goals were scored by Jessica Bass (2), Erin Boschen (3), Kelsie Moss and Kala VanHuss. Shelly Reneger scored for Liberty. The Falcons placed a stake in the ground for District 11 Monday evening, as they took on the top-ranked District 12 squad at Cooper. Senior Lorin Opfer muscled her way past two Ozark midfielders and launched a low hard shot to the right corner of the goal in the 26th minute to score the eventual game winner for her team late in the first half. The Tigers only offensive foray of the half had come a few minutes prior and it seemed to invigorate the Falcons. The second half followed a similar pattern, punctuated by freshman Emily Cline’s goal from the left side, one minute in when she buried Lindsey Sprouse’s cross from the right. Cline scored a second, her 11th of the season, in the 54th minute to seal the win. It came as the Tiger’s fought to clear a ball from the box. Opfer picked up the clearance outside the box and sent a ball in that Cline was able to settle, turn and shoot as GK Paige Hemphill charged off the line. Hemphill played another fine game, showing a reservoir of courage that continues to astound. The Tigers fought hard the entire game, a lesson learned early this season and a key tool if they want to earn their first District title since 2001. Shelby Hatz put the Irish on top in the 15th minute when she finished a ball from Tara Bailes. 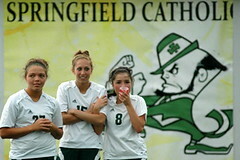 Catholic dominated play in the first half getting 20 shots and 9 corner kicks, but only managed one goal. The girls were able to convert three in the first 18 minutes of the second half, however, to come away with the win. Tara Bailes hit a nice shot just under the bar from 18 yards in the 46th minute from an Anne Prenger free kick, Andrea Parker converted a Natalie Smid corner kick in the 56th minute and Shelby Hatz finished the scoring in the 58th minute on Tara Bailes second assist of the game.